except state and federal holidays. Guana Trails and Beach Lots: Daily, 8:00am to sunset. At the main entrance to GTMNERR, stop in at the first-class education center to pick up a checklist and trail map. 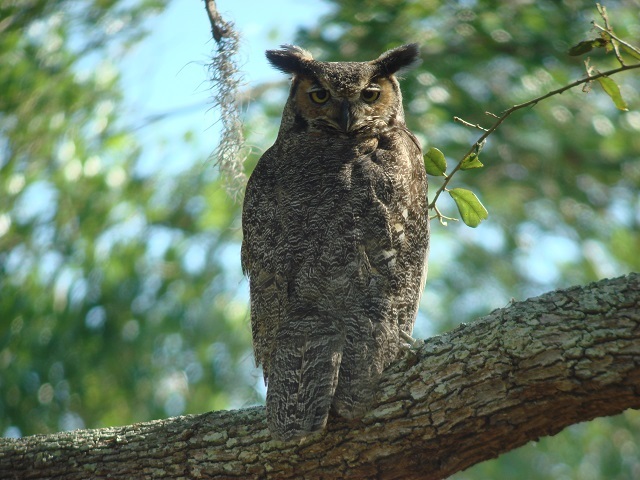 Ask for information about educational programs, including bird walks. Over 200 species of birds have been recorded at this trail site. It is renowned for viewing the fall Peregrine Falcon migration; local birders head here to watch and count them each year. To witness this spectacle yourself, visit the tower at the North Beach Use Area (on the beach side of A1A) during the first two weeks of October. As falcons migrate south, they follow the dune line and often hunt for shorebirds and waterfowl along the way, putting on a quite a show. This overlook also offers a great vantage for scoping for seabirds like Magnificent Frigatebird and Black Tern. Check the powerlines along A1A for breeding Gray Kingbirds and check the Guana Dam for migratory shorebirds and ducks. Bobolinks like the fallow area leading up to the hiking trails in fall and spring, and the hammocks play host to warblers (28 species have been recorded), buntings, grosbeaks and other songbirds. Hike south on the Timucuan Trail and South Point Loop (5+ miles round trip) to the southernmost point where American Oystercatchers loaf on shell spits and Reddish Egrets forage in the shallows. Keep up with the Trail. Sign up and select “Wildlife Viewing”. DMCA Policy ©2015 Fish & Wildlife Foundation of Florida, Inc. All Rights Reserved.